The modern nylon-bristled toothbrush we know today, made its appearance in 1938, but the idea behind teeth cleaning actually goes way back to ancient history. Take a look at the fascinating history of toothbrushes and how it has evolved over time. The earliest history toothbrushes, or what comes close anyway, is found in ancient Egyptian history in the form of a chewing stick. These sticks came from a tree called Salvadora persica, which is also known as miswak. The sticks usually had a side that functioned as a toothpick, while the other side was frayed and acted as a mechanical means to clean teeth. 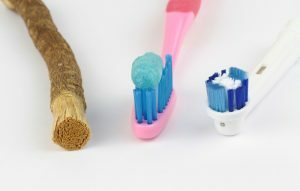 Not only were these chewing sticks used for cleaning teeth, but also ground pumice and vinegar were used as a whitening method for that extra bright smile. Unfortunately, usage of these last two quickly led to dental damage and were eventually abandoned for better methods. Bristle toothbrushes popped up as a popular innovation during the Tang Dynasty in China. Typically, animal bones or bamboo sticks were used along with hog hair bristles to make the first bristle toothbrush. These bristle toothbrushes were eventually introduced to Europe during the 17th Century and grew in popularity. Eventually hog hairs were traded out for a less firm and gentler substitute – horse hair. These bristle brushes slowly replaced the “Greek Method” which involved using a linen cloth dipped in salt and sulfur oils to rub the surface of each tooth. The first mass-produced toothbrush was invented by a former jailed rioter, William Addis. While in prison, he drilled small holes into an animal bone and sourced bristles from guards. He used glue to seal the bristles. Once he was released from prison, William Addis started a business, called Wisdom Toothbrushes, and produced the first manufactured toothbrush, making a fortune. By 1938, animal hairs were replaced by nylon fibers, and celluloid handles (which replaced animal bone) made way for thermoplastic materials. And now we have electric toothbrushes as well! I guess you could say the rest is history!